My Cleaning Products shared a number of tips to help the public solve post-winter rust problems. It also recommended an organic-based rust removal spray to make the process safe and even offered samples of it. ...Rusterizer is both effective and safe. It cited that it could get rid of rust or rust stains in seconds on almost any material. It added that it contains no harsh chemicals, so, it is safe as well for health and the environment. With the heavy snow that fell over the winter, corrosion was expected to be a problem later. And so, in order to help the public deal with it, My Cleaning Products shared a number of rust removal tips. It also recommended a spray to make the process safe. All it takes for rust to form is just a little moisture, said MCP. And the melting of snow, it explained, provided so much of it that corrosion could take place anywhere, even inside houses and buildings. But rust, it stated, doesn't just ruin the metal items. It cited that its stain could also damage other materials as fabric, wood and even concrete, thus, degrading their value. In order to save those items, My Cleaning Products said that one must be quick to respond. Once the rust or its stain is spotted, it stressed that its source must be detected and fixed. That way, the worst of its damages could be prevented and unnecessary expenses are avoided. Usually, leaks are the sources of rust, said MCP. And so, it advised the public to always check the plumbing and piping for any of it. Air-conditioning units, walls and ceilings must also be inspected, it stated. When the source is determined and fixed, it said that the actual rust treatment must promptly follow it up. But to immediately and personally implement it, it cited that one would need a rust removal spray first. And so, it advised everyone to get one beforehand. Nonetheless, the company stated that just any spray for rust won't do. Out of the many available for purchase, it asserted that Rusterizer is the one the public should get. As it reasoned out, that's because Rusterizer is both effective and safe. It cited that it could get rid of rust or rust stains in seconds on almost any material. It added that it contains no harsh chemicals, so, it is safe as well for health and the environment. 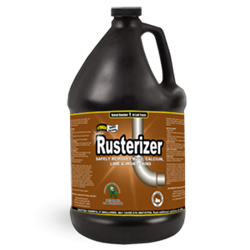 After the rust removal with it, MCP also recommended the use of Rusterizer Armor. This product, it stated, helps protect the surfaces from the same rust problem. To try the solution, the company invites everyone to visit its website at mycleaningproducts.com and get the Rusterizer Complimentary Sample.